According to the authors of this new paper, current global climate models "predict a robust increase of 0.5-1 K in EIS over the next century, resulting in a 2.3-4.5% increase in [mixed layer model] cloudiness." EIS or estimated inversion strength has been shown by observations to be correlated with cloudiness, as demonstrated by the 2nd graph below from the University of Washington, indicating a 1 K increase in EIS results in an approximate 4-5% increase in low cloud cover [CF or cloud fraction]. Thus, a combination of observational data and modelling indicate clouds have a strong net negative feedback upon global warming that is "not captured" by current climate models. Large-scale conditions over subtropical marine stratocumulus areas are extracted from global climate models (GCMs) participating in Phase 3 of the Coupled Model Intercomparison Project (CMIP3) and used to drive an atmospheric mixed layer model (MLM) for current and future climate scenarios. Cloud fraction is computed as the fraction of days where GCM forcings produce a cloudy equilibrium MLM state. This model is a good predictor of cloud fraction and its temporal variations on timescales longer than 1 week but overpredicts liquid water path and entrainment. GCM cloud fraction compares poorly with observations of mean state, variability, and correlation with estimated inversion strength (EIS). MLM cloud fraction driven by these same GCMs, however, agrees well with observations, suggesting that poor GCM low cloud fraction is due to deficiencies in cloud parameterizations rather than large-scale conditions. However, replacing the various GCM cloud parameterizations with a single physics package (the MLM) does not reduce inter-model spread in low-cloud feedback because the MLM is more sensitive than the GCMs to existent inter-model variations in large-scale forcing. This suggests that improving GCM low cloud physics will not by itself reduce inter-model spread in predicted stratocumulus cloud feedback. Differences in EIS and EIS change between GCMs are found to be a good predictor of current-climate MLM cloud amount and future cloud change. CMIP3 GCMs predict a robust increase of 0.5-1 K in EIS over the next century, resulting in a 2.3-4.5% increase in MLM cloudiness. If EIS increases are real, subtropical stratocumulus may damp global warming in a way not captured by the GCMs studied. Observations show that on daily to interannual timescales, stratiform low cloud fraction CF is strongly correlated with the lower tropospheric stability LTS, defined as the difference between the potential temperature q of the free troposphere (700 hPa) and the surface, LTS = q700-q0 (Klein and Hartmann 1993). Relationships between LTS and CF from observations in the tropics (Slingo 1980) and subtropics (Klein and Hartmann 1993) have been used in the parameterization of low cloud cover in general circulation models (e.g. Slingo 1987; Rasch and Kristjansson 1998) used to predict climate changes. They are also a key assumption in the thermostat hypothesis of Miller (1997) and in the climate sensitivity study of Larson et al. (1999). Both of these studies result in a strong negative low cloud feedback on climate changes due to a marked increase in low cloud cover as the sea surface temperature SST increases. However, it has yet to be demonstrated whether the observat ionally-derived LTS-CF relationships will hold in a changed climate. We have derived a new formulation, called the estimated inversion strength (EIS) to estimate the strength of the PBL inversion given the temperatures at 700 hPa and at the surface (Wood and Bretherton 2006). The EIS, which like LTS depends only upon the 700 hPa and surface temperatures, accounts for the general observation that the free-tropospheric temperature profile is often close to a moist adiabat and its lapse rate is strongly temperature dependent. Therefore, for a given LTS, the EIS is greater at colder temperatures. We demonstrate that while the seasonal cycles of LTS and low cloud cover CF are strongly correlated in many regions, no single relationship between LTS and CF can be found that encompasses the wide range of temperatures occurring in the tropics, subtropics, and midltatitudes. However, a single linear relationship between CF and EIS explains 83% of the regional/seasonal variance in stratus cloud amount (see Figure below), suggesting that EIS is a more regime-independent predictor of stratus cloud amount than is LTS under a wide range of climatological conditions. The result has some potentially important implications for how low clouds might behave in a changed climate. In contrast to Miller's (1997) thermostat hypothesis that a reduction in the lapse rate (Clausius-Clapeyron) will lead to increased LTS and increased tropical low cloud cover in a warmer climate, our result suggests that low clouds may be much less sensitive to changes in the temperature profile if the vertical profile of tropospheric warming follows a moist adiabat. There is some evidence that recent syntheses of state-of-the-art climate models are demonstrating a weaker cloud feedback than previously thought (Soden et al. 2006). Our results give some physical basis for why this might be expected. They also provide strong constraints for evaluating these models. LEFT: Low cloud cover CF, vs LTS (top) and vs EIS (bottom). Solid circles show long term seasonal means from the tropics and subtropics, while open circles are for the colder midlatitude regions. Notice that EIS is a much more appropriate measure across a broader range of temperatures, which suggests it may have skill in predicting how low clouds may change in a future climate. Klein, S. A. and D. L. Hartmann: 1993, The seasonal cycle of low stratiform clouds. J. Climate, 6, 1588-1606. Miller, R. L.: 1997, Tropical thermostats and low cloud cover. J. Clim., 10, 409-440. Rasch, P. J. and J. E. Kristjansson: 1998, A comparison of the CCM3 model climate using diagnosed and predicted condensate parameterizations. J. Clim., 11, 1587-1614. Slingo, J. M.: 1980, A cloud parameterization scheme derived from GATE data for use with a numerical model. Quart. J. Roy. Meteorol. Soc., 106, 774-770. Slingo, J. M.. 1987, The development and verifcation of a cloud prediction scheme for the ECMWF model. Quart. J. Roy. Meteorol. Soc., 113, 899-927. Soden, B. J. and I. M. Held, 2006: An assessment of climate feedbacks in coupled ocean-atmosphere models. J. Clim., 19, 3354-3360. Wood, R. and D. L. Hartmann: 2006, Spatial variability of liquid water path in marine boundary layer clouds: The importance of mesoscale cellular convection. J. Clim., 19, 1748-1764. 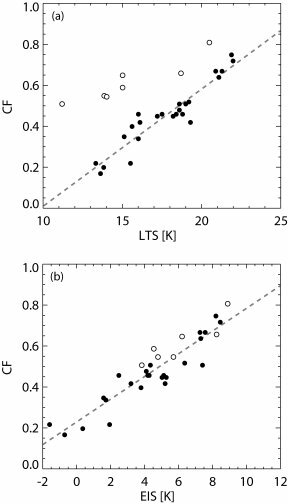 Wood, R. and C. S. Bretherton, 2006: On the relationship between stratiform low cloud cover and lower tropospheric stability. J. Clim., in press.